I was reading the Working RE survey results and have a few thoughts outside of the survey questions. 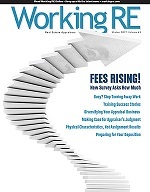 The story states that many appraisers have gotten out of the profession due to lack of business. I’m curious why they have a lack of business. I’m currently a Certified Residential Appraiser. I’ve been doing appraisal work for 30 years. I started doing assessment work for my township back in the 1970s then moved into appraisal work. I live in a small town 8-15 miles from the commercial-industrial areas in central Wisconsin. I work from home. I started working for AMCs (appraiser management companies) about 15 years ago, along with mortgage brokers. The big banks in the nearby cities hardly ever ordered an appraisal through me because they felt somehow that an appraiser with an office in the city is better. That left mortgage brokers and AMCs for business.